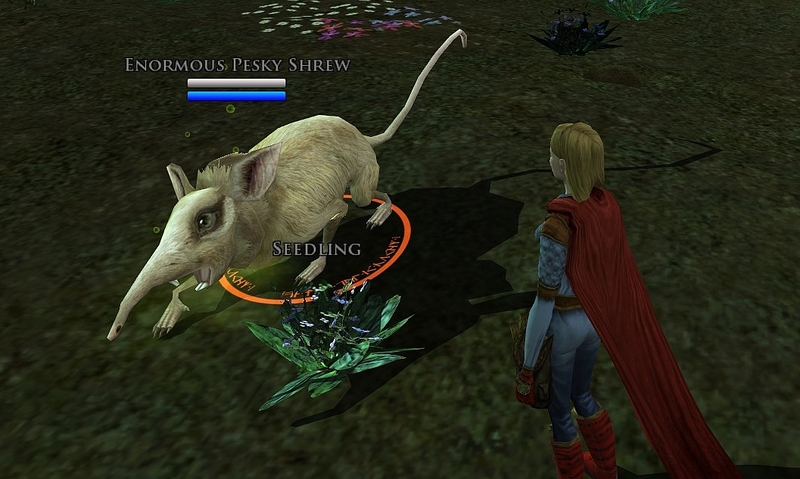 Supergirl of Lorien: Spring Shrews, Shrews, Shrews! Hello hello! I know… you came looking for Ingolemo… but I have to get something off my queue. Shrews... Shrews... Shrews... Exciting word, yes? 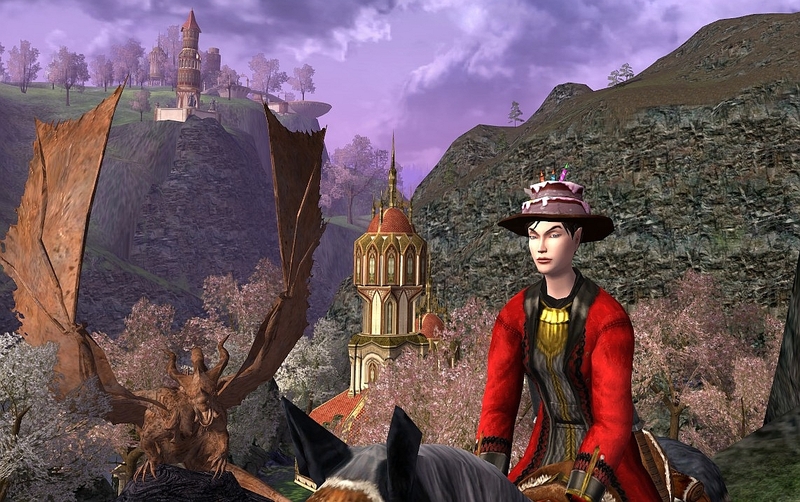 The Spring festival ended two weeks ago and I haven’t written a Spring festival wrap-up post! I will obsess over it if I don’t get it written. I was trying to think which festival I like most, and decided that I like all of them. 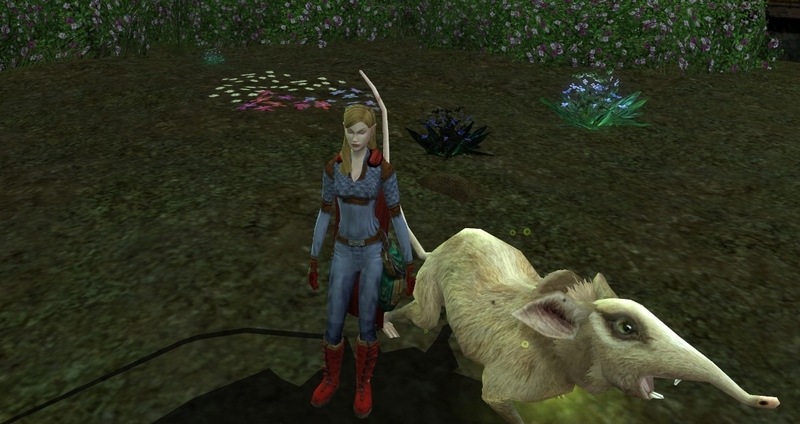 I love the Haunted Burrow, and the Shrews & flowers, and summer fishing, and even Frostbluff (though the idea of stealing from people makes me sad, so I normally just eat too much food instead). Spring festival holds a special place for me, because I arrived in Middle Earth during the 2010 Spring festival. 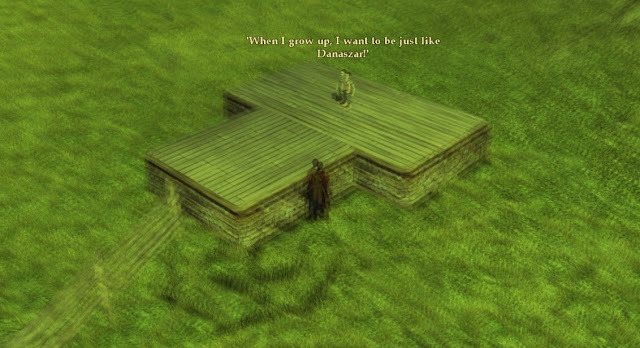 As an elf, I started my adventure in Celondim, and I recall seeing the big orange message throughout Ered Luin concerning “Stomp-a-shrew in Duillond”. It took a bit to find Duillond and understand that a festival was going on, but I was hooked. I’ve said it before, but it still rings true that festival is a great way to break from the routine and meet new people as well as celebrate with people you know. Spring festival was no exception as I got the honor of meeting a few people like Tomeroric, Cessy, and Llynthe. Here is the most noble Tomeoric. He caught up with me in Duillond and said he actually recognized me from this blog! It is common to ask a fan for his picture and autograph, right? He graciously obliged for this photo. I had to chase Cessy down into Moria, having missed taking her picture in Duillond with the shrews or flowers. (Note to self, remember to charge the camera each time I go out.) 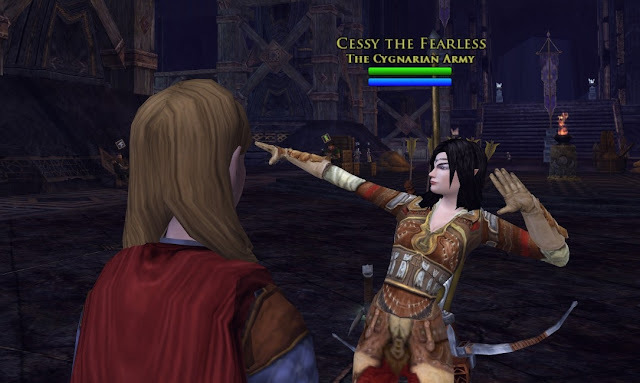 Cessy shows that she can work a Supergirl pose! Own it, girl! Watch out boys, Cessy is Fearless! And, Llynthe! I was saying hello to people I pass on the street when I came across Llynthe. I was thinking... "she looks so familiar. did we do Foundry? no. Roots? no. Moors? no. Some older content? no." 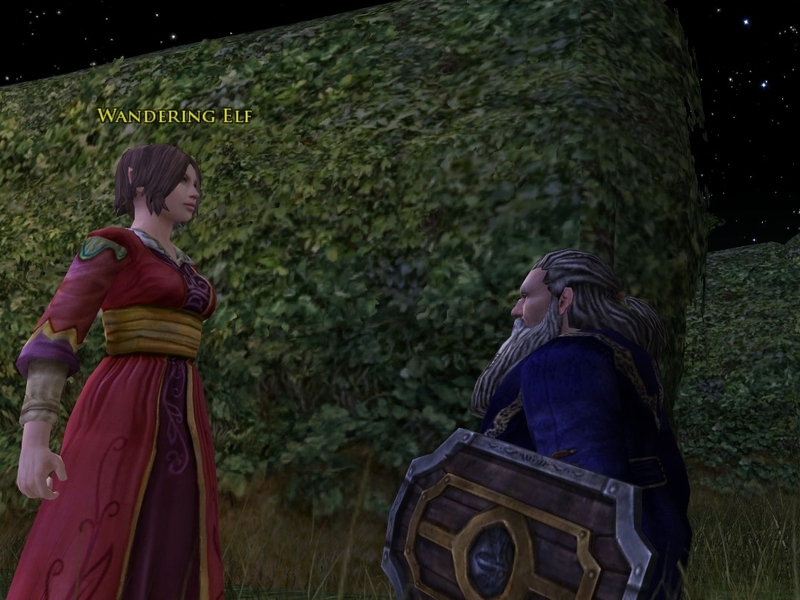 Llynthe is the famous writer of http://thehobbitsinthestories.wordpress.com/. It is a bit mind-numbing during the Spring festival, but I liked the collecting flowers quest! It is peaceful to roam the countryside collecting flowers, lol! The rewards for collecting flowers were… really lame, hehe. Of course, the only good thing to come out of it was the Steed of the Jester (Jester), which is just a matter of luck, and I got enough Huge flowers that all the hobbit quads could have one. If I was the boss, I might change this quest to reward spring leaves or marks. Even I, who really enjoyed it, couldn’t imagine collecting even one more flower after about 4 hours of it during festival. "When I grow up, I want to be just like Danaszar!" Indeed. Me too little hobbit quest guy. Me too. Love the festival maze. The only downside is that one can only do it about 4 times a day for collecting barter leaves. 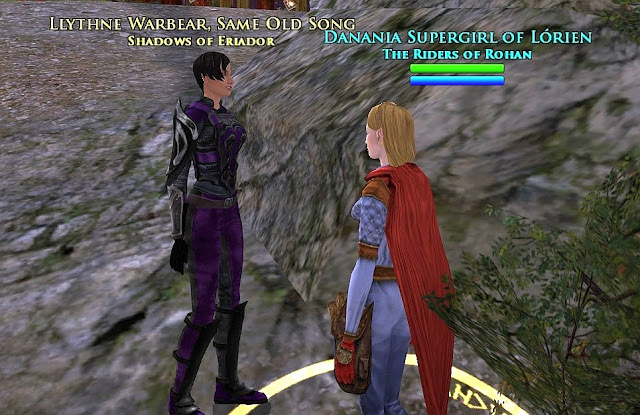 I think Danaclaus was more interested talking to the Wandering Elves than actually mazing. It is a good place to run crazy, have a few Dire Beers, scold some naughty tween hobbits… Good times. Symbelmyne Spring horses for all. 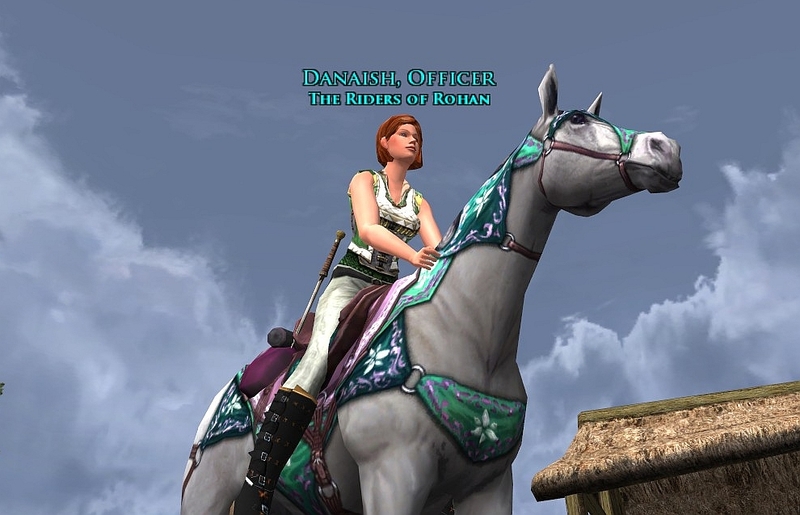 It suited Danaish quite well as she prepared for a ride across the countryside. My love/hate part of the festival is the "consumables for deed". If you use 300 of a certain consumable, you will be allowed to do that specific action as a skill. For example, this spring's consumables were the Doom-shrooms and D.R.A.G.O.N. I totally love setting a goal and achieving it, especially with these consumables. What I Hate though... I deal with the fact that the consumables take many festival tokens (ex. spring leaves), typically about 180 tokens per 300 consumables. 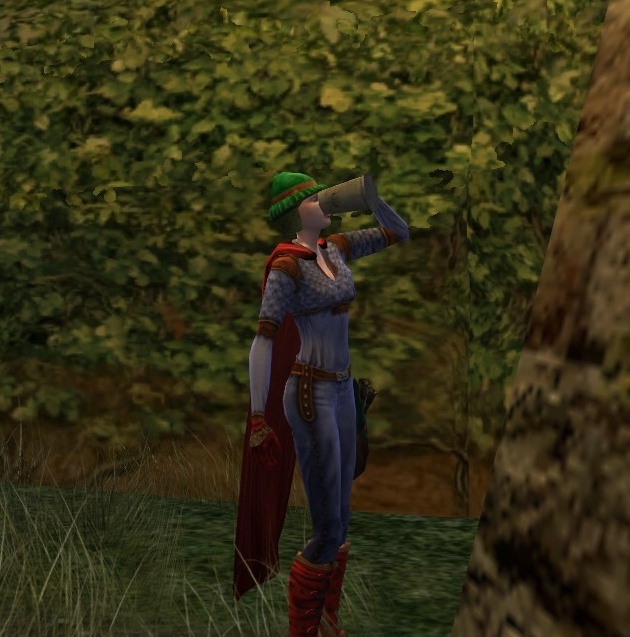 However, the really bad part, which is on my top 5 least favorite things in lotro... is that the consumable has a 5 minute Cooldown. With some of the ones in the past (youll-yule-festival), they were on the same CD timer. Fortunately, the spring ones were not, but we still must wait 5 minutes between uses. At best, that is about 25 hours of throwing tricks at other people. AND... they do not advance while in a raid, and they do not work in the Ettenmoors. So, you have to be (1) somewhere with people, (2) not in the moors, (3) not in a raid, (4) be willing to continue to throw obnoxious things at people as often as the CD timer expires. I need to make buttons for "/thank you for helping me with my deed" and "sorry I had to hit you. again. with a doom-shroom". My goal is to finish the 300 by the start of summer festival, so I can get more things to throw and wait on long CDs. 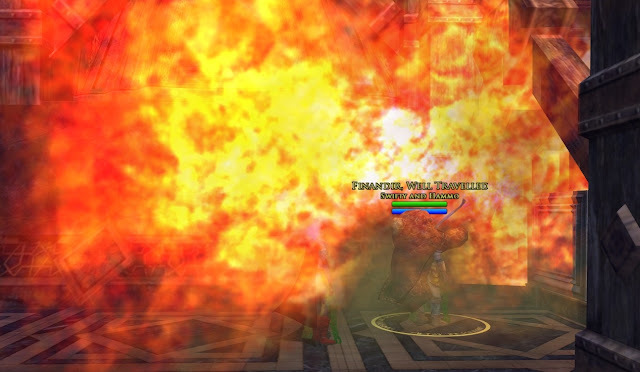 Here is one of my victims getting a face full of of exploding shroom and dragon fire. 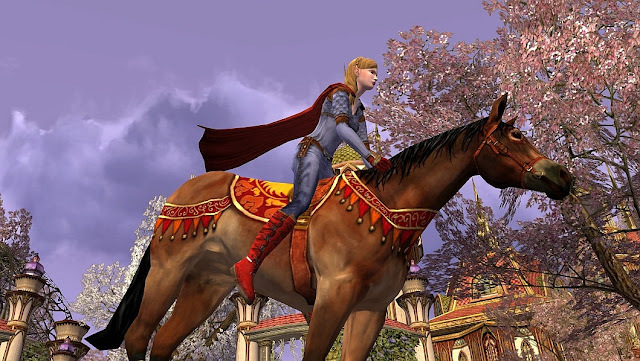 Alas, spring festival only happens during the spring (or in lotro’s case… early summer). I will see you again next year Mr. Shrew. 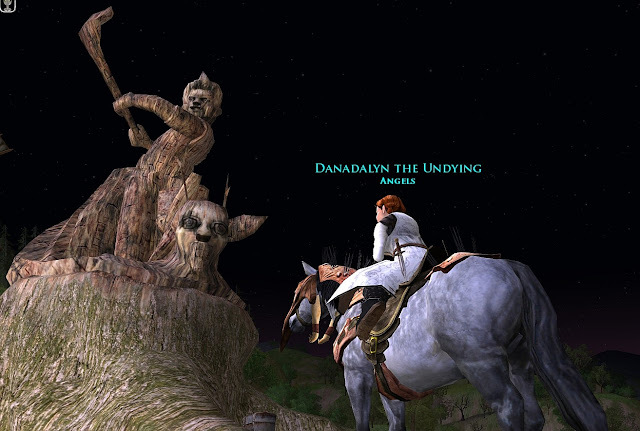 Finally, here is Danaszar in her Anniversary hat, Yule robe, riding a Dusk steed, in front of the Angel’s Draigoch statue (draigoch-statue-lil-danas-moving-day). It doesn’t have anything to do with Spring festival, but it was a nice picture and I told her I would post it. I’m already excited for Summer festival! It must be coming up soon-ish! I didn't know about the consumables for deed part. It does explain though why people would randomly use the dragon breath one while waiting for the Stomp-a-Shrew though! I will have to remember it next year too. Word on the wind is that in July there will be a "Farmer's Faire". No idea what that is except it is labelled as a festival between spring and summer. I'm sure it will be lots of fun! I remember last summer, and hopefully this one will be just as fun... hobbit/dwarf races, fishing adventures, collecting stuff... steeds and dancing! good times, good times. Check it out. I changed my name back :) I love the festivals. Did you know that during the winterfest that if you help the poor folks you get some beautiful clothes from them about a month later? I did! Thanks for bringing it up for those who didn't know that! In the post, http://www.danania.net/2012/02/lil-danas.html, Danaish is wearing the special dress & Danaclaus is wearing the matching robe.